This holding has been handed down to us from generations; we built the house ourselves with our own labor, it cost us £220. As for the land, no one worked harder to improve it. When the time for eviction came, we were firmly resolved to defend it with our lives. We blocked the doors with formidable logs and treated the windows in like manner. On the morning of the eviction we were up at the break of day and laid our plans, each to defend a certain point and none to waiver, whatever might come. We boiled plenty of water and meal, and, when all was ready, kept a look-out for the bailiffs. We hadn’t long to wait, as the attacking party appeared at half ten o’clock and formidable they looked too – police, soldiers and bailiffs, all followed by a large crowd of tenants. We had two portholes broken out commanding the eastern rear corner and had plenty of pitchforks and poles to meet the rifles and bayonets when they would attempt to scale the windows. Mr. Davitt, however, deprived us of the pitchforks. I guess he thought there would be blood spilt if they were there. When the bailiffs approached with picks and axes we waited until they would come near enough for the hot fluid to scald them. The police shouted to us to go in from the portholes or they would shoot, but we took no notice of them. I remember that, as they raised their rifles, the thought struck me that it was a queer country where sons of the people were the greatest enemies. 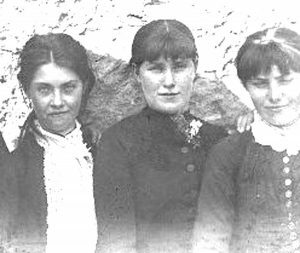 The bailiffs attacked the corner and the sisters threw cans of boiling water on top of them, making them speedily retire, while the girls stood waiting with more water ready to fire. The crowd outside became terribly excited, as they saw by this that we meant no surrender. I had a long pole defending the corner, and found that I could not use it effectively from the porthole as I was left-handed; so I broke a hole through the roof, a shower of slates falling on the men outside. Then we saw that we made it impossible for them to continue at the corner. For three-quarters of an hour the struggle continued, and finally, the defeated emergency men gave up, some of them well scalded. Then they went to the end of the house and the police got scaling ladders to get through the window on the second storey, so I exchanged places with my brother and went to the porthole which he had been defending. At this time some unfortunate delay occurred about handing up the water. My brother went to see what was wrong, and while he was so engaged a policeman entered through the window. He was met by Honoria who caught a grasp of his bayonet. He was just in the act of jerking it from her and I knew that if he pulled it he would cut her fingers off. I jumped off the platform and struck him with my fist under the chin and sent him sprawling to the other end of the room. My sister then had the rifle, bayonet and all, and sure she did use it. She rushed to the window and scattered the police outside right and left and cleared the ladder outside. My brother had now returned with the water, and I went to Honoria’s assistance. I got a big pole: there was a policeman at the top of the ladder; I put it to his chest, pushed him into an upright position. The policeman behind him pressed him on, while the crowd yelled with delight. I shoved harder and he fell to the ground amid cheers and shouts. Others pressed on, to meet the same fate. Now we thought it was high time to evict the policeman we had inside. We got him near the window to throw him out. The police outside rammed their bayonets and wounded us several times, so we had to throw him back again instead of throwing him out. The fight now began properly. We attacked them with all our might and so fierce was the struggle that we smashed a sword-bayonet and injured several of those outside. Eventually we cleared the window again and victory was hailed with thunders of applause. The forces outside were dismayed, as if they did not know what to do next. We thought to use the respite we got by now ejecting the policeman, but Father Hannon put up his hands and said: ‘Don’t throw him out, Frank.’ The good priest knew that the police would fire the next time. Well, his word was law so I let him go. The police then rushed in after Father Hannon who held me as if in a vice. A great big coward of a policeman struck my mother and handled her brutally. ‘Father Hannon’ said I, ‘are you going to hold me while they choke my mother?’ He let me go. I made a spring forward and struck the policeman a blow of my clenched fist, which quietened him anyway. The house then became full of police and several of them grappled me. I made no further struggle; I knew that it was useless and felt satisfied that we had done all in our power. We were all taken into custody to be sent to jail, and Father Hannon got permission for Mr. Davitt to accompany the girls to jail. They brought my mother and myself to Limerick Jail, where we were kept until the trial. All the tenants took forcible possession immediately, and they remained there until a settlement was come to the following February. We were unable to learn what the settlement was, but the report provides a stark example of the brutality experienced by courageous tenants at the hands of greedy landlords supported by the British government. This was not the worst of the evictions, but it is one for which we found rare documentation. Most of us had a relative who lived through the terrible 1880s after just emerging from the Great hunger of the 1850s. Remember them and take pride in their courage, like the Bold Beauties of Bodyke.